Churchill reportedly once quipped that one can always count on the Americans to do the right thing after they have exhausted the other possibilities. That description fitting for Europe at the moment. Greece should not have been allowed to amass such a large debt relative to the size of its economy in the first place. The debt restructurings were too limited and too small to fundamentally change the underlying debt dynamics. The weekend referendum in Greece marks the end of the extend-and-pretend strategy. Although Merkel argues that it is now up to Greece to make fresh proposals, we suspect the initiative is still with Europe. It can no longer decide if there will be debt relief, it can only decide the form it takes. It can be a messy default that ultimately leads to Greece leaving the monetary union. Under this scenario, Europe loses billions of euros. Some countries whose banks did not lend to Greece still are exposed via their capital key. This would undermine the fiscal situation of many countries including those whom least can afford it. The secondary implications are also immense. It would sacrifice the irreversibility of the euro forever and over sums that will seem meager to our grandchild. An exit now risks turning every crisis into an existential crisis. It would expose the southern flank of Europe while refugees flee ISIS and the failed state in Libya seek haven. 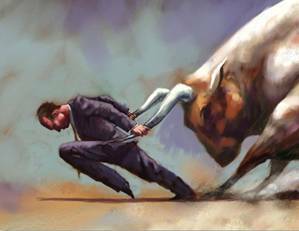 The alternative for Merkel and European leaders is to grab the bull by its horns. Understand that there will be enforced debt relief if Greece were to default. Rather than set off an unpredictable though costly chain of events, organize the debt relief, and get something in exchange for it. Nearly a month ago, we identified this as the basis for a compromise that we had thought events in Europe were evolving toward behind the scenes. Envision debt relief that is offered on conditions of enforceable structural reforms. Out of respect for the lack of trust that the Greek people have expressed toward the official creditors, European officials can use the Greek government's overtures to the OECD to drive the reforms, including advisers embedded into different ministries and agencies. Paying one's taxes can become an act of patriotism under the right conditions. Promoting profit-seeking behavior and discouraging rent-seeking behavior can be an antidote to corruption. The combination of the Greek referendum and the further deterioration of its economy and financial system means that the endgame is finally at hand. The issue is the type and conditions of lowering Greece's debt burden. Many talk about the contradiction at the heart of EMU between a single monetary policy and national fiscal policies. Yet European officials have found a way to circumvent this as European taxpayers are on the hook for Greece despite the rules that prohibit fiscal transfers. Arguably a more significant contradiction is less readily acknowledged: The export orientation of by far the largest economy in the region requires its trading partners to go into debt. In the pre-EMU past, countries devalued. This course is blocked now. This does not end the story. By preventing currency crises, EMU facilitates banking and sovereign debt crises (the order of which need not concern us here). Greece proved to be the unintended midwife of European-wide reforms and institutional capacity building in the 2010-2012 period. By accepting and trying to control Greece's debt relief, European officials could once again be allowing Greece to provide this vital function. The failure of individuals to service their debt no longer results in debtors' prison. Corporate failures have become routinized. European officials need to devise mechanisms to deal with sovereign debt problems short of ex-communication. Events have superseded the question of whether there should be debt relief for Greece. One way or the other Greece's debt burden will be lightened. It is either done on terms that European officials negotiate, or it is done in the unsentimental and uncompromising marketplace. Neither choice is pleasant or without pain. One builds on European integration, and, arguably, may even deepen the democratic roots. The other confirms the failure of leadership to preserve the integrity of the EMU for ultimately paltry sums and unleashes an unpredictable, and potentially disastrous, chain of events.